EdrugSearch.com is a website which is claiming that can help people to spend much less on their medications and therefore to save much more as this is a site offering prescription drug price comparison. They claim this is a great resource for those people who are searching for safe and low cost online drugs from licensed pharmacies located in US and Canada. Therefore, this is not an online pharmacy, but a resource of where people can get the lowest prices for highest quality medications. eDrugSearch.com besides offered resources, they also offer community and means to assist the clients into making the best decision about where they are able to purchase the medications they need online. 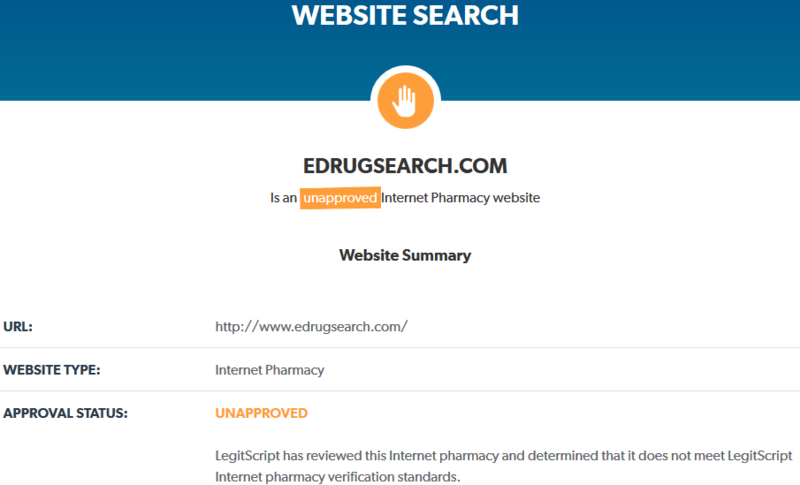 According to the information on their website, eDrugSearch has been featured in: CBS, Health 2.0, Business Journal as well as The Wall Street Journal and since this is a prescription medications price comparison source, they are transferring you to licensed online pharmacies by means of easy-to-use drug searching engines as well as comprehensive use. According to their site, eDrugSearch.com is a portal which is currency providing access to people to more than 100,000 of online prescription drugs meaning that customers have a high chance to find their needed medication on their site. They claim that using the site, you are able to save up to 90% on your prescription drugs. 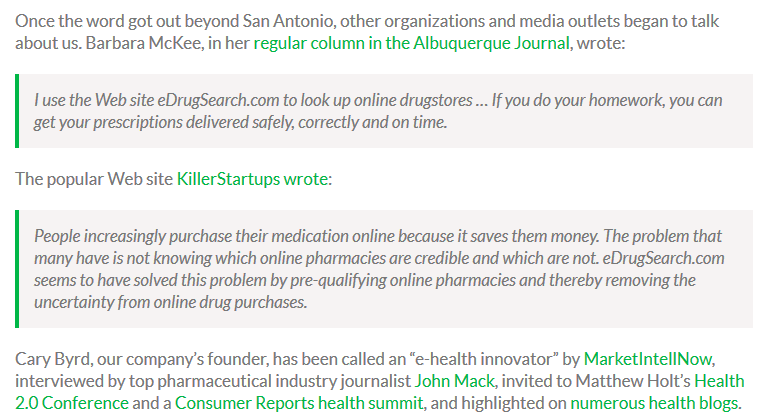 As much as I found out from information on their site, eDrugSearch.com is a company based in San Antonio and it is being owned and led by Cary Byrd, a person which is considered to be an experienced entrepreneur that has been an advocate of secure online pharmacies. 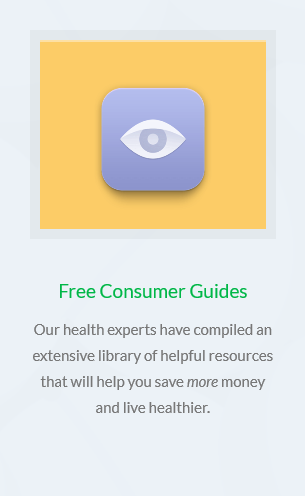 Make sure you do understand the fact that this site is only helping people to find their cheap medications as nor the owner of any of the site’s team is considered to be a medical specialist, therefore you are not going to find on the site any type of medical or healthcare advice, or diagnoses and treatment. The site is only informational and offering guidance, nothing more, which is comprised of pharmacies only that is requesting and is verifying the doctor’s valid prescription before selling the consumer a prescription drug. Another thing to mention is that eDrugSearch.com is claiming to offer up to date (updating by minutes) drug price searching, detailed drug information as well as other features which makes the entire prescription price comparison easy to use and understandable. According to the information on the site, they are the best option for those people who really need to purchase medications online and want to get some savings. Plus to that, the advanced searching on the site is allowing customers to find pharmacies that are having specific requirements such as accreditations, memberships and many more. They claim that eDrugSearch has been online for 11 years since 2007 and since then, millions of Americans have already turned to eDrugSearch.com for help which has saved a lot of money. Most importantly, they are a free cost-comparison engine for prescription drug prices and currently they have earned the loyalty of millions of consumers. There is also a list of licensed online pharmacies that they *proudly support*. Plus, this company seem to be an active social media user, therefore you can follow their activity there in case you want to. All in all, the information I managed to find looks pretty good, but there are other things we should take in consideration. It is important to keep in mind that eDrugSearch.com is not an online pharmacy that you can purchase medications from, it is a search engine which is offering customers the most affordable prices for many different medications at many different online pharmacies located in US and Canada. Nevertheless, since they are a prescription drug price comparison engine, it is obvious they should have a diverse assortment of medications to attract customers with their different medications needs. Remembering what I earlier mentioned, the site claims they are having information about more than 100,000 drugs currently. By searching for information on their main page, you can find a lot of different methods to search for the needed prescriptions. It is obvious one of the methods include the search box function by the keywords which you can use. Except for this option, the pharmacy is offering a list of top selling medications, clicking on them you would get the comparison of drug prices and get free rx coupons too. You should choose the needed drug and you’re going to see what the pharmacies are having in their stock and what’s the price of it. 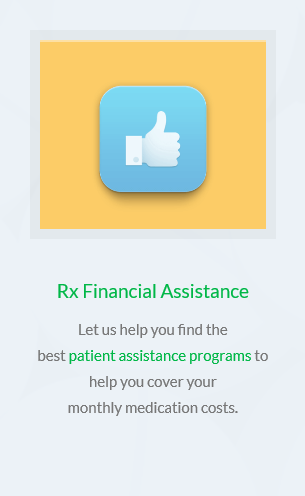 it seems to be easy, you’re redirected to the pharmacy chosen where you should get informed about all the other information about payment, shipping etc. 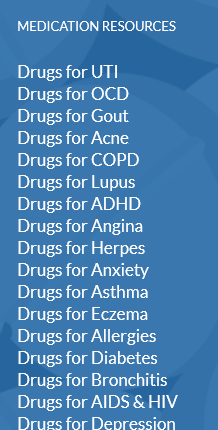 Since I see such a big selection of drugs plus their claim of over 100,000 different drugs, I can assume the assortment of drugs at eDrugSearch.com is very rich for which I rate them with 5 stars. As it was earlier mentioned, the company claims that they are offering customers savings of up to 90%. They claim to have real life savings and on their main page there is an example of those savings. They offer the price for a specific drug (90 day supply) at a local US pharmacy price and compare them with the price at an online pharmacy price. Lately they share what are the savings. As much as we can see in their example, savings are anywhere between 64% (for Tarceva 100 mg 30 pills) and even more than 90% (for Crestor 40 mg). In terms of money, the savings are from at least a few hundred $ to thousands of $. I wanted to get an example and I searched for Viagra. I noticed their claim that there’s a store which sells generic Viagra 50 mg for 0.16 USD per pill which is a price that I’ve never seen before. Not sure if that price is even possible, but if customers can indeed save that much, the prices or better said the *savings* using this site may indeed be very big. It is obvious that in case that’s a real price per pill for generic Viagra 50 mg then I doubtlessly rate this unit with 5 stars. Other Facts about eDrugSearch.com and Why to Use this Site? Usually, I at this point in my pharmacy reviews, I am talking about shipping policies and payment options. But remembering that this is not an online pharmacy and you can’t purchase anything from this site directly since they do not sell anything themselves, it is obvious there are no shipping or payment options. Instead, I can talk about other factors about this site and about the reasons why they claim the site is worth using. As said earlier, the company has been online for 11 years and millions of American has saved a lot of money already, up to 90% of savings and that’s really good. The company is claiming to do business only with pharmacies that has good security and privacy measures and generally – legitimate pharmacies meaning that customers shouldn’t be afraid to get medications from the site they are redirecting to. In addition to this, as I said earlier, the company is proudly supporting a number of different online pharmacies. Assumingly, those are pharmacies which are offering the lowest prices for medications and assumingly are all safe to use. Since I do think that there are good reasons as to why customers have reasons to use this site, my rating for this unit is 5 stars. All those reasons are explained above. Using the google page sped insights test data, I have determined that this online pharmacy has a lot of issues in regards to the page speed for mobile version. It got a rate of 14 out of 100 which is very slow. Luckily, the desktop version for page speed data is a lot much better, green marked rated with 95 out of 100. The fact that the pharmacy is having a really good desktop version page speed is good, nevertheless, the mobile version is a big problem and for this reason I am going to rate this unit with 3 stars. Except for the fact that any website should have some good technical characteristics in terms of page speed, they also should have a mobile version since there are a lot of nowadays customers that prefer to arrange orders and browse website through their phones. Luckily, it does seems that edrugsearch.com is having a mobile version of their website which is allowing the mobile user clients to browse the site easier. The elements are easily readable, text is not too small or too large, images are adapted for small screens and there does not seem to be any drawbacks in the navigation of the site. Nevertheless, there’s still one pretty annoying problem – the site is extremely slowly running on a smartphone. This problem was mentioned in the previous point, we can see it for the mobile friendly test and I encountered this problem myself when tried to access the site. Overall, my rate is 4 stars since mobile users navigate too slow. Is the Connection Secure on eDrugSearch.com? It is very easy to check if the connection is secure on this site – check for the green lock near the address bar. Since this online pharmacy does seem to have a secure connection that’s very good as customers data is kept in safe. The page is protected by 128 bit encryption protocol and this security certificate is being verified by a well known company: COMODO CA Limited. In the end, my rate is going to be 3 stars here. They do offer a secure connection, however they refused to offer company owner information which is a problem but the biggest problem is the fact they are using the lower security level of 128 bit, while there is more advanced security of 256 bit SSL security. Although this is a site that is created for customers to click on links and be redirected to other pages/ website, the company decided NOT to have an antivirus on their site. To my opinion, that’s an extremely big problem. I can’t be sure that clicking on links on this site, browsing it, and being redirected to other pages won’t get my computer or device get infected with malwares, viruses or other internet threats. Nowadays, the internet is full of millions of treats such as viruses and it is important for this site to have an antivirus installed. This is a big negligence that the administrator of the site should pay attention and install the antivirus software to keep the customers navigation through their site safe. Until then, my rate is 1 point. How to Find the Needed Medication? As said, this site is not an online pharmacy so you are not able to make an order here, instead, you are able to find the needed medication for cheap prices at other online pharmacies, being able to compare the prices with the guidance of this site. as I earlier said, there are several different methods available to customers to find whatever drug they are searching for. One example is the search box function by keyword, you can also search for whatever drug you need using the categories of medications you can find on the bottom of their website and lastly, you can also find the needed medications searching through their top medications. What’s really important here is the fact that customers do not need to pay anything to find the needed drugs and even important is the fact that they do not need to register here. I already mentioned earlier the fact that customers can find whatever they need in 3 easy steps (see screenshots above). All you have to do is to find the needed drugs using the method I earlier explained, compare the prices and then click on the suitable option. You would be able to compare the drug prices, free rx coupons and see online pharmacy ratings. I really love the fact that this pharmacy is showing what pharmacy you’re seeing the price on, what’s the quantity, what’s the dosage, they share the total price and they also share the price per pill. This means that you can very easily find whatever you need, make the calculations and make a final decision. In addition to all of this, the company claims that customers can also get free consumer guides as well as Rx Financial Assistance. I really do love the fact that you can very easy and fast find whatever drug you’re searching for, the prices are easy to compare, there are advanced functions for searching and finding information that you need and all of this is offered by eDrugSearch.com. It seems that it doesn’t take too long until the moment you get to buy whatever you need. My rate is 5 stars here. Is eDrugSearch.com Legit and Secure? Although this site is very popular, old domain age, shared all the information accordingly about the company and owner – they are not having full trust by scamadviser.com. There seem to be a malware report detected for this site and it has been listed as unapproved pharmacy. The site has been threat listed and has a trust rate of 75% meaning that care should be taken when using this site. This is all really confusing information but site administrators should do something to get maximum rate and remove the alarming notes. As for now, my rate is 3 stars. As much as we can see, this site has been listed as unapproved by legitscript.com. The unapproved status offered by legitscript.com is quite problematic as it means that they might be doing illegal activity on their site and overall business or is not meeting some requirements of legit script. The best status of legit script is approved while the worst is rogue. 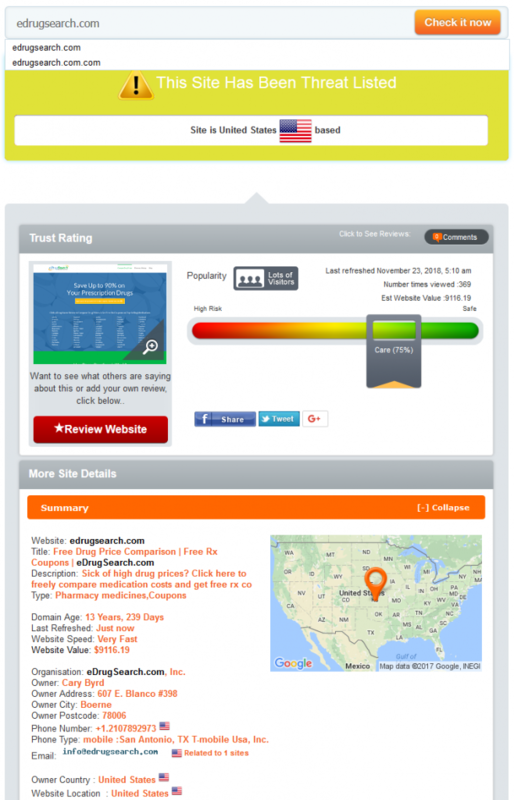 Since edrugsearch.com is unapproved my rating is 2 stars. As much as I noticed, the site does have some customer reviews being featured on-site. Those testimonials are not located on a separate page and they do not seem to offer one, instead you can find the reviews on edrugsearch.com which periodically change themselves, without customers having the opportunity to search back or further through the reviews. In the end, my rate is going to be 3 stars and I am going to explain why. I have no opportunity to see all the reviews written by customers, there are no dates meaning we don’t know when the reviews appeared and I have no idea how they appeared on the site at all. I was searching for customer reviews about this site on other third parties sites where I did managed to find a couple of reviews. For example, I found 6 different reviews on trustpilot.com but then again, what’s strange all 6 reviews are rating it with 5 stars. That’s suspicious, but hopefully that’s true and it is only me who is too skeptical. Problem is that the last customer reviews was written a year ago while all others where written in 2012-2014 period. My overall rate for all these reviews I found is 3 stars. I am not able to click on that icon and therefore, I am not able to get any information or to prove that this site is indeed offering some coupon codes. If they would have offered coupon codes that would have been a big plus, indeed, but unfortunately, so far my rating is 1 point here. Searching for ways to get in touch with this company I couldn’t find anything at all except for when I clicked on *contact us*. The big problem is that the only way to get in touch with this company is by using the contact form that I have managed to find there. There is absolutely nothing else. No phone numbers, exact address, email address, fax or anything at all. I do remember their claim to be located in San Antonio, but there is no prove. For the contact information I managed to find I rate them with 1 point as contact form only definitely is not enough. 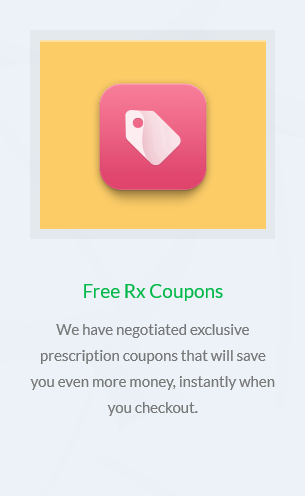 As I have already said, the only way to get in touch with this pharmacy is using the contact form and since I had no other option (no live chat function or anything else), obviously, I used that form to ask them more about the coupon codes and how I am able to get them. I asked my question indicating the email where I should have received the response back. I waited for more than one full day and still the response never arrived. Not getting a response from customer support group obviously makes me rate them with 1 point for this unit. 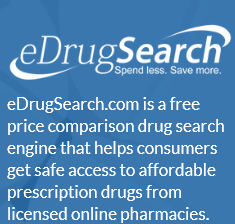 eDrugSearch.com is not an online pharmacy but it is a prescription price comparison service which connects the online pharmacy and the customers, allowing the customers to find the lowest possible prices for their medication. According to the information on their site, the company is located in San Antonio, but there is no prove of that. Assumingly, they should have a lot of different medications in their database and seemingly, the site works with 16 different US and Canadian pharmacies. eDrugSearch.com is having a bit of problem discovered by Scamadviser.com which overall has a rate of 75% and it is having an approval status of Unapproved by Legit Script suggesting that it does not meet all the requirements to become legal. The site is using a low security level and big problem is that customers are not safe from viruses as no antivirus is installed on the site. The site has appeared a long time ago, yet it has few customer reviews, most being positive, but there are also speculations it is a site ruled by *Big Pharma*. One big problem is the fact that the only way to get in touch with them is contact form and yet – nobody answers to your questions using that form. I recommend people to review all data and think twice before making a decision.